*For the past 18 months, my wife and I have been writing articles that reference the concept of “creating” a life to live for. I came to the realization the other day that we were not actively trying to ‘create’ this amazing journey that we had been envisioning, but that we were actually in the midst of ‘living’ this incredible story. What follows is an update on our journey, some reflections on lessons learned, and what we hope lies ahead for our vision and venture, To Live For, LLC. A quick recap is in order. Last September, after producing, along with EmpowerME, two awesome live shows, “INSPIRED,” in Brunswick and Portland, featuring LT Smooth and local musicians Chris Kemp White and Jackie Ellsworth, we headed off to Costa Rica for 6 weeks, in what was intended to be a self-retreat of writing, yoga, and surfing. For me personally, these 6 weeks allowed me to finally bring together current and past stories to author my first book, or, perhaps, better described, journal, which I hope to publish soon. My writing sessions in Costa Rica were only separated by wonderful connections with friends, challenging surfing sessions on the turbulent waves, tropical storms, naps, and many walks on the beach or in the jungle. We left Costa Rica to spend a couple of weeks on the west coast (USA) with family and friends, and then we landed on the Big Island, Hawaii, to serve as resident managers of the lovely and sacred 16-room Kona Tiki Hotel on the rocks and waters of Kailua-Kona, Hawaii. This position was physically challenging in that we worked EVERY day for nearly 6 months, but is was rewarding as measured by our connections with inspiring visitors from around the globe, working with a staff that taught us about ‘Ohana’ or family, and majestic time in nature. After our 6 month stint as hotel managers, we vacationed for a week on the garden isle of Kauai, where we successfully navigated our need for restorative sleep and down time and our deep desire to be in nature as much as possible. 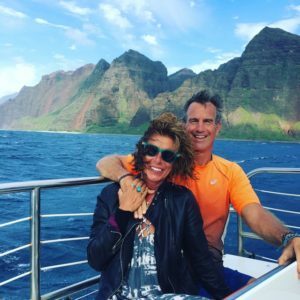 Our last night on Kauai pretty much sums up our entire 8 month journey as we joined about 30 other brave (or crazy) souls to sail 15-20 foot waves so that we could marvel at the beautiful Napali Coast during sunset. Even as I write this, I smile at the notion that this 4 hour excursion on the Lucky Lady actually brings into focus the lessons I learned during the past 8 months, and the messages and hope that we are trying to radiate through our business, To Live For, LLC. Captain Tom greeted his excited passengers with an aloha and a stern warning that the winds may lead to a shortened trip along the majestic Napali Coast and that anyone prone to seasickness should take medicine now. The captain even offered us the chance to vote to see if we wanted to head south, away from the unpredictable wind and waves. Our decisions along our personal journey are made in the same way, I believe. We assess the pros and cons, we seek guidance of wise leaders, we look to nature and her signs, and, then, we take a vote, whether it is our own internal vote, or that of a collective people on the same journey. Only one person voted to head south, so we boarded the Lucky Lady for a chance to visit this amazing part of Kauai, land that is only view-able by challenging hikes, by sea, or by air. Once we left the protection of the harbor on our catamaran, indeed, the wind and waves picked up. I love boating and waves so I was up for the adventure; besides, it was over 30 years since I viewed the Nepali Coast from the ocean. We snacked on crackers, fruit, and cheese as the lush green and deep rust colored cliffs of Napali appeared off our starboard side. MaiTais flowed freely but I knew this was probably not the best drink to consume in rough seas. (I don’t drink alcohol but I was concerned for the other passengers.) I started to breathe into the motion of the waves and the radiant beauty of the coast. I am in my element and glory but other passengers were leaning over the stern, throwing up into the ocean or ‘aloha’ buckets provided by the deck hands. Donna Maria elects to stand at the bow of the boat, as if she were re-enacting that famous scene from The Titanic movie. The boat slides up a 15 foot swell, and then, boom, it falls into the trough of the swell, waves crashing over the deck, soaking anyone daring to be on the front deck. Donna Maria is thrilled, just as she was when jumped out of a plane at 10,000 feet to go sky diving, interestingly, almost at this same spot off Kauai 2 years ago. I am fine where I am at, sitting on the top deck, thinking my wife is a tad crazy. She loves this sort of adventure since it is kind of like flying through the sky. She’s an angel. Makes sense. Me, I would prefer to be connected to the earth in some fashion. I am the shaman type dude in our relationship. That’s what cool about life, isn’t it? We each can thrive in, and enjoy different ways of being in our joy and passion. The key is being open and respectful of our different ways of walking our paths. I just smile while Donna Maria takes on the waves. I am not worried about her, though I do begin to wonder when the captain will turn to boat around. Suddenly, a rear passenger yells at the captain to slow down. A pod of spinner dolphins were riding the waves crossing our path. It was exhilarating to see these creatures slice in and out of the surf. Having just spent the last 6 months on the Big Island, where I swam with wild dolphins 2 or 3 times a week, I just smiled at the Universe with gratitude for blessing us with dolphin medicine during our last night in Hawaii. We stayed with the dolphins for a few minutes, and then turned backed into the wind and waves to see more of the Nepali coast. I don’t know where this part of the world ranks in terms of natural beauty, but it has to be pretty high on any list. Natural beauty. Nature. I am convinced that our glorious earth holds the medicine, the elixir, the best answers to our questions, ailments, and crises. I believe that if we connected with nature every day, if even for a few minutes, we would be a happier and healthier people and community. The waves begin to become relentless and bigger, but the deeper and richer beauty of the Nepali coast, cliffs, hills, and waterfalls have yet to be fully explored. I remain calm and just focus on the beauty. We set goals and have hopes, but nature, or The Universe, sometimes sends a signal or a clear ‘stop sign,’ and today the Captain read the warning signs, and adjusted our course. While we didn’t make it to the hopeful end point of this boating adventure, the setting sun and luscious Napali coast provided the perfect ending to our 6 month stay in Hawaii. The gratitude for all that we experienced the past 6 months fills my heart, as does the beauty that surrounds us. The captain turns the boat around, putting the fading sun and fierce winds behind us. The ride, all of a sudden, becomes smooth and quiet. Everyone feels calmer, and, I suspect, thankful that the captain made the decision to turn around. Sometimes the benefits of our decision to alter course aren’t known or appreciated until later in our journey, so the key is trusting our deep intuition. When we landed on the Big Island to manage the Kona Tiki Hotel, we hadn’t booked our flights off the island. Something told us to not plan an exit, but, instead plan for the unplanned. As it turns out, we were asked to extend our contract by nearly 7 weeks, and that is why we are now vacationing for a week on Kauai. Four and a half months of managing a hotel became 6 months of working every day in a row. What a blessing our job was, in many many ways, but we sure were ready for a week off from every day duties. We met people from all over the world, and some of these people will be friends for life. Their stories were sacred and special. We were allowed into the hearts and lives of guests who have been coming to the Kona Tiki for decades. We laughed and cried with our guests, and we always ended their visits with an aloha hug. Nature is part of our internal and external guidance system. Be with her as much as you can. Appreciate all that is around you: nature, others, your self, your place. All work and no play is quite a challenge. Seek a healthy balance. We all have a story. It is important to listen deelpy to our own story and to each other’s story. There is an ‘Ohana’ or family of like minded people who are part of the healing our society and earth needs. Find this family if you want to share in this mission of healing. Since our last live show in September, we have been pretty quiet on social media and on our website in terms of our To Live For venture. The time and energy devoted to serving the hotel, the land, and the guests became our focal point. Service is a significant part of our vision, so we are taking the next few weeks to listen for where we feel called to serve next. In the meantime, we are back in Maine to re-connect with family, friends, golfing, nature, and each other. Paul is providing some consulting on leadership to a local company and Donna Maria will be teaching yoga on Bailey Island and offering holistic healing sessions out of her new Freeport healing space. We will certainly keep you posted on these fronts. Humpback off Kona. Photo by Anne Knoll. 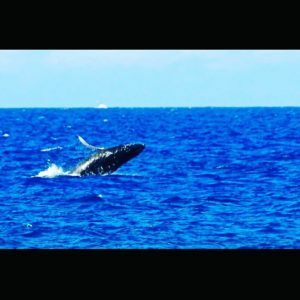 The humpback whales we were blessed to see during the winter months are in Hawaiian waters to give birth, and then they migrate back to northern waters (Alaska) by the end of February or early March. We are sailing the Kauai waters in May, so it was absolutely amazing when a humpback whale breached the water to the starboard side of the Lucky Lady with the sun nearly gone behind us. How much more special could our last night on Hawaiian waters get? A boat trip on the Napali coast, with an awesome staff and fun passengers, and with dolphins and a whale visiting us, all while the sun is sending love and joy out through its fading rays and turning the green coast to a gold coast. My smile is endless as I thank Pachamama and God for the past 6 months of living in Hawaii, and as I marvel at how the majesty of these islands and the sacredness of our time here were all captured in this 4 hour boat ride along the Napali coast. Respect and gratitude for our earth, for the staff, ownership, and guests of the Kona Tiki, for new friends, and for the animals of the sea who have been our guide and our teachers. Thank you universe for allowing us to remain focused on our passions: serving people, being in nature, writing, teaching, and spreading love, joy, and positive vibes. This is what ‘To Live For’ is all about. Indeed, we are living a life to live for. Humbly and with immense gratitiude.